I was given the website address for Crochet Guild of America, but I have deleted it.
" You can give without loving. But you cannot love without giving." As far as the east is from the west, so far has He removed our transgressions from us. Just as a father has compassion on his children, so the Lord has compassion on those who fear Him. INTENDED HIS CHILDREN TO BEAR." Who was the son of Neriah? Use an over the door shoe hanger to store small balls of scrap yarns and threads. You can store similar colors in the same pocket and so you can see at a glance the color you need. Just a massive thanks for all the info on your site :) I am new to crocheting, but with the help of your site I have completed 4 rows of a compicated dress pattern and I only taught myself to crochet a day ago! As fun as knitting and it looks brilliant, cannot wait to finish it and wear it :) Thank you for all the help! Thank you so much for your patterns. I have made many gifts using the patterns and plan to continue. Thanks for sharing. 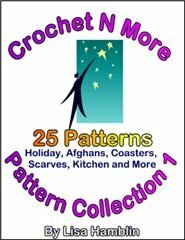 Yes... you may use any of my patterns to make items for sale. All I ask is my pattern(s) not be sold and that you give the buyer my website address: http://www.crochetnmore.com Thanks for asking and have a wonderful day! called "adjust this pattern for your dog". "Then for rnd 13 do sl sts (remember how many for rnd 21) for how wide the dog's chest is (from the outside of one leg to the outside of the other) and then hdc in each remaining stitch." That means you work slip stitches for how wide your dog's chest is from the outside of one leg to the outside of the other. Then you half double crochet in the remaining stitches. Now remember how many slip stitches you made because you need to know that for round 21. Thank you for the pattern. I’m anxious to get started. I’m confused about what hooks to use. The pattern refers to Hook H, Steel #7, and a G hook. Do I need all 3? Row 1 says to use the Steel #7 and also the G hook. Is this correct? You're the first person to bring this to my attention. There are two hooks... the size G (though and H would probably work just as well), and a size 7 steel hook. The size 7 is needed to make the first row onto the towel. Then the G hook is used to make the actual topper. 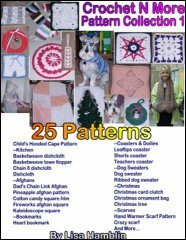 I have made the change to the pattern page... thanks so much for telling me! what does it mean when the beginning of the pattern says 1-row repeat? This means you repeat one row of the pattern over and over. I would like to submit my baby cocoon pattern to your list of patterns. 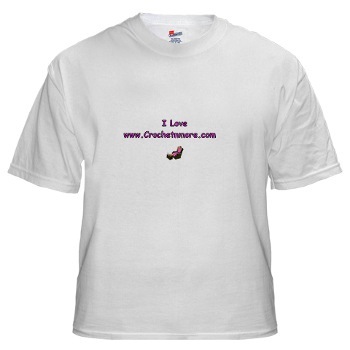 It is Free and I know alot of people would love to do these cocoons for charity or gifts. I am new to this posting my patterns, but would love to know of any babies, preemies or other that got a cocoon made from my pattern :) I love crocheting and love giving! Pass it forward is what I always say. I'm happy to include your note in the September 15th issue of the CNM Newsletter. This is a very unique pattern and I'm sure the viewers will love it. In many patterns we are instructed to work "over" stitches. 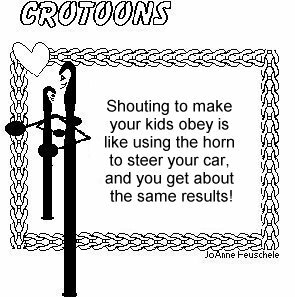 In your case, you work behind them which will leave the puff stitches undisturbed. while the puff stitches remain in front of the hook and not engaged in the stitch in any way. The paw print afghan square is 7-1/2 inches by 7-1/2 inches square. 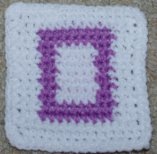 You can make an afghan using any number of these squares to obtain the size you want. If you want an afghan that is 45 x 60 you would make it 6 squares wide and 8 squares long. 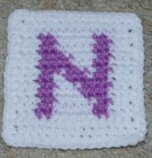 For a variation you can also make solid squares and alternate them with the paw print squares. Hi, I have a pattern that I'm not sure I understand what it wants and it's driving me crazy. It is as follows: Row 2...(right side) Change 3 (counts as first dc row now and throughout), dc in next dc *Fpdc around next stitch, dc in next 2 dc, skip 2 dc, 5 dc in next dc, skip 1 dc, dc in next 2 dc, Fpdc* repeat from **, dc in last 2 dc, turn. I understand it up to the repeat from ** does it mean once or till the end as I tried both and I had two many stitches left at the end or too few. What am I doing wrong? Any help you can give me before I snatcdh myself bald will be greatly appreciated. Row 2...(right side) Change 3 (counts as first dc row now and throughout), dc in next dc *Fpdc around next stitch, dc in next 2 dc, skip 2 dc, 5 dc in next dc, skip 1 dc, dc in next 2 dc, Fpdc* repeat from **, dc in last 2 dc, turn. This means Row 2 is the right side. You chain 3 and that will count as the first double crochet. Repeat from **... should say Repeat from * to *. That just means you repeat instructions between the asterisks across the row. then your repeats should repeat over and over until there are two doubles left. my mother and I was wondering how much yarn I would need to purchase? Thanks! It depends on how big you want to make it and if you only use the ribbon squares. If you alternate the ribbon squares with all white squares then you will need more white and less pink yarn. The overall yarn amounts will depend on how you want to design the afghan. A flight attendant was on the red-eye to Manila when a water leak developed in the galley, which eventually soaked the carpet throughout the cabin of the 747. A very sleepy passenger who had become aware of the dampness asked the attendant, "Has it been raining?" Keeping a straight face, the attendant replied, "Yes, but we put the top up." My wife and I are both in an Internet business, but she's the one who truly lives, eat, and breathes computers. I finally realized how bad it had gotten when I was scratching her back one day. "No, not there," she directed. "Scroll down." My wife never quite got the hang of the 24-hour military clock. One day she called the orderly room to speak with me. The person who answered told her to call me at the extension in the band rehearsal hall. "He can be reached at 4700, Ma'am," the soldier advised. With a sigh of exasperation, my wife responded, "And just what time is that?" During "children's time" in the worship service, the kids came forward and the pastor, wanting to teach about prayer,asked, "How can we talk with God?" The pastor produced paper and envelope and said, "Maybe we can write God a letter. Does anyone know God's address?" Then the pastor pulled out his cell phone and said, "Maybe we can telephone God. Does anyone know God's phone number?" Then the pastor displayed his lap top computer and said, "Maybe we can send God an e-mail!" A little five-year-old enthusiastically said, "Yeah, try www-dot-God-dot-com!" Service in the restaurant was abysmally slow. My husband was starting to flip out, so I tried to distract him with small talk. "You know," I said, "our friend Christi should be having her baby anytime now." "Really?" my husband snapped. "She wasn't even pregnant when we walked in here." Because if they lived near a bay they'd be bagels! "How about adding a few extra parts to the bill for this truck repair? We'll let the company pay for it, and you and I can split the difference." Dad refused, but the customer was insistent. "I come through here a lot," the man continued. "We could make quite a bit of money." Dad said that wasn't how he operated. "Everyone does it!" the man yelled. "Are you some kind of fool?" Burning mad, Dad asked him to leave and take his business elsewhere. Suddenly the man smiled and extended his hand for a handshake. "I own a trucking company," he said. "I've been looking for a mechanic I can trust, and I'm not taking my business anywhere else!" "I PRAY FOR A NEW BICYCLE... I PRAY FOR A NEW NINTENDO... I PRAY FOR A NEW VCR..."
Hey Doc! What's My Propblem? Patient" "Exactly what's my problem, doc?" Billy Joe was in court charged with parking his car in a restricted area. The judge asked him if he had anything to say in his defense. "They should not put up such misleading notices", said Billy Joe. "It said, FINE FOR PARKING HERE."